Well, the holidays have come and gone. As much as I love that time of year, I’m kind of glad to be back in a routine, not just stuffing my face with 10 zillion cookies and indulging in a few too many holiday treats. We had a great trip up North! It’s been foreverrr since Nick’s gotten so much time off (two whole weeks! ), so it was nice to just relax. Usually trips home are so rushed and I feel like I never get to see everyone I want to see or do everything I want to do. After two weeks we were definitely done, satisfied, and ready to come back to Mississippi. I made this roast before we left for vacation, but with the craziness of baking a million batches of cookies, I never had time to post it. Though I’ve made a ton of dishes with ground deer meat, this was the first time I’d attempted a roast. The apple is supposedly used to take any gamey flavor out of the deer, and I suppose it worked, because it definitely tasted nothing like deer to me! Spread the olive oil on the inside of a crock pot. 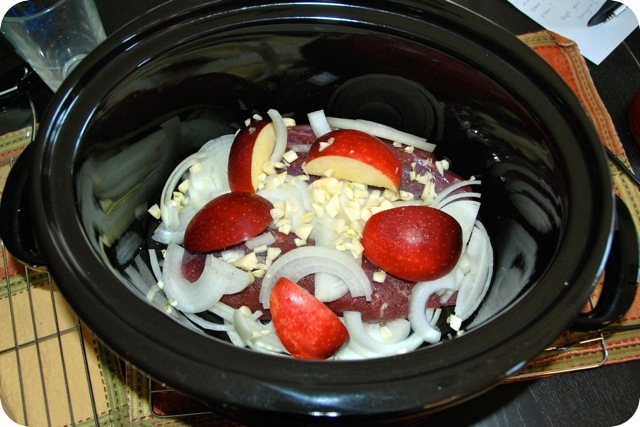 Place the venison roast in the bottom and top with apple, onions, and garlic. Cook on low 6 to 8 hours, until roast is tender. 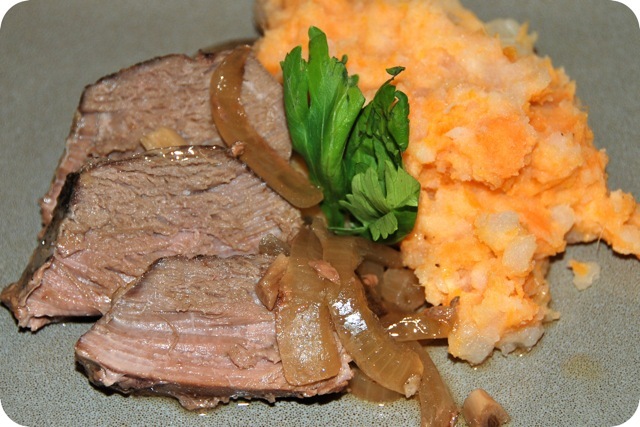 When the roast has cooked, remove it from crock pot, and place onto a serving platter. Discard the apple. 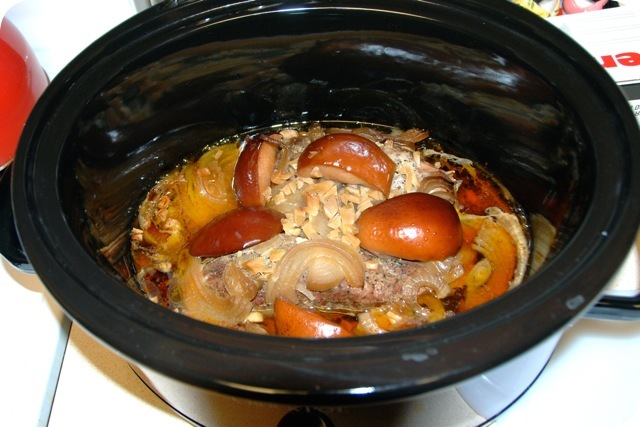 Stir the water and bouillon into the slow cooker until the bouillon has dissolved. Serve this as a sauce with the roast. The roast literally fell apart. I wasn’t sure if it would be tender since it’s typically the fat in meat that makes in tender and deer has very little fat. But the slow cooker works miracles! It was definitely the perfect way to cook this roast! 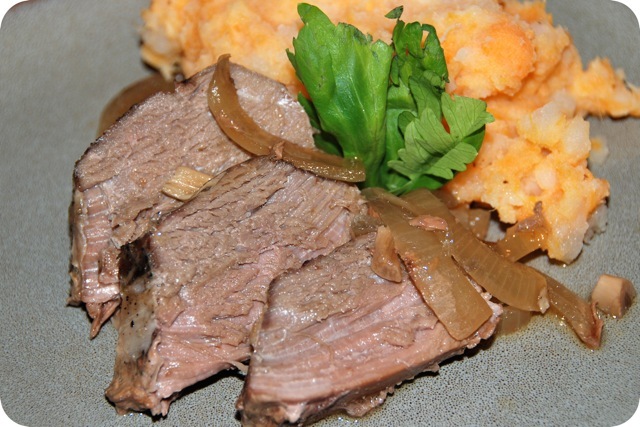 This vension roast looks super-delish! I loved this recipe. I added celery, carrots and a little salt & pepper…delish! No stock or liquid? Seems like it would be dry.